As you likely know, the final mission in Super Mario Odyssey’s Snow Kingdom is known as the Bound Bowl Grand Prix. 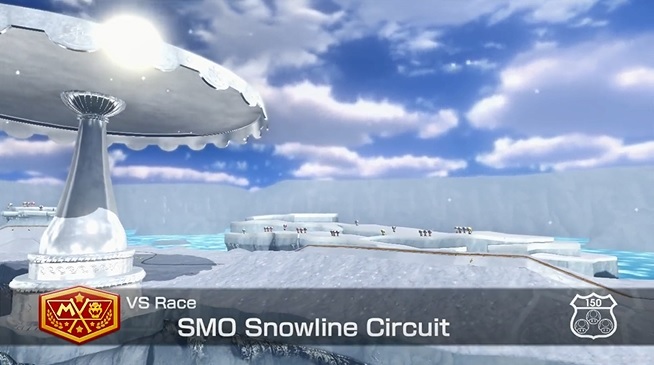 This is a racing mini game where players have to bound around an icy track in order to win a Multi-Moon, with extra prices being available for harder variants. It’s an interesting challenge, and a moderately fun mini game whose high scores can also be shared online. However, as it turns out, that mini game isn’t all the track can used for! And what’s more, it works really well too. Oh sure, it doesn’t have the most complex layout (that’d probably be the Iceburn Circuit) and it’s not super gimmicky (like say, Mount Wario), but it’s a nice solid track design that’s plenty wide enough for karts and works really well in Mario Kart 8’s physics engine. What else from Super Mario Odyssey could work as a Mario Kart track? New Donk City? Tostarena Town? Steam Gardens? Maybe even a new version of Bowser’s Castle based on the one from Odyssey? All of those would be fantastic ideas, and all could become likely now models are being ripped from Super Mario Odyssey and imported into games like Mario Kart 8. The possibilities really are endless, and the list of cool custom tracks still to come will likely just grow and grow. So yeah, check out the track if you’re interested, and download it from the Mario Kart 8 custom track wiki too.